False chinch bug (Nysius sp.) 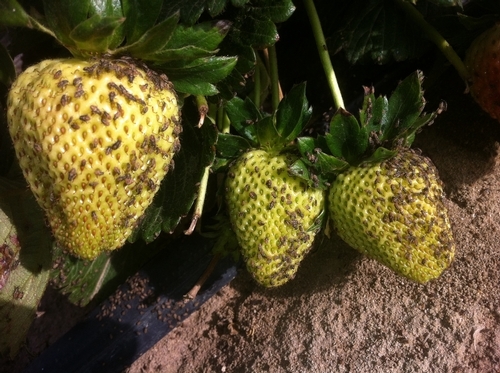 infestation on strawberries (Photo by Sal Ponce, Pacific Coast Produce. There was an isolated incident of heavy infestation in a Santa Maria strawberry field with false chinch bug, Nysius sp. (very likely N. raphanus). False chinch bug is normally not a pest of strawberries or cultivated crops. They usually multiply on herbaceous weeds during spring time and move on the nearby cultivated crops when the weed hosts dry out. 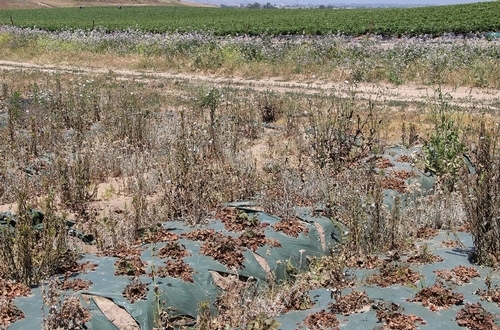 In the current incident, an old, leftover strawberry field with severe weed growth right next to the cultivated strawberry field harbored false chinch bug populations which moved to the new strawberry field. The grower immediately treated the field with malathion and bifenthrin (Brigade) that effectively controlled the migrating pest. This is a classic example of weeds and alternate hosts serving as a source of pest populations. It emphasizes the importance of cultural practices such as managing weeds and alternate hosts of pests and good agronomic practices for controlling pests without pesticide application. 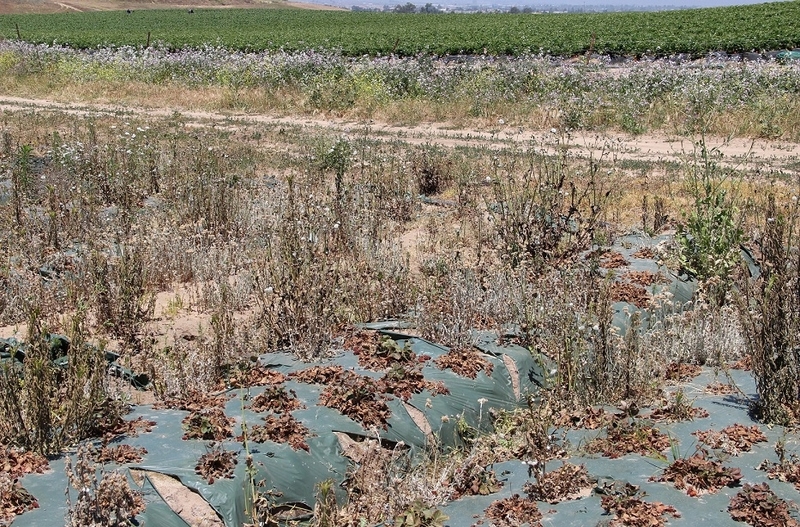 Such cultural practices are also important for avoiding early infestations of lygus bug, a major pest of strawberries in California's Central Coast. 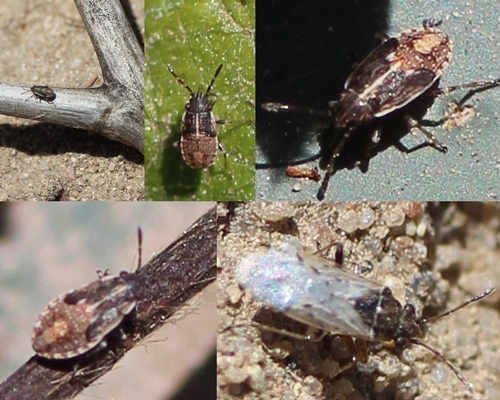 If you notice false chinch bugs in strawberries or other crops this article should help you in identifying and taking appropriate action. False chinch bugs are true bugs belonging to the order Hemiptera and family Lygaèidae. Members of Lygaèidae are generally known as seed bugs. Crops pests like lygus bug (Lygus spp. - family Miridae) and chinch bug (Blissus spp. - family Blissidae), and beneficial predator, big-eyed bug (Geocoris spp. - family Geocoridae) are some other commonly known lygaeids. Host range: False chinch bugs are usually found on grassy and cruciferous weeds in spring and move in large numbers to nearby vegetation when the weed hosts dry out. They can be a nuisance to farms, orchards, landscapes, and gardens. Damage: Nymphs and adults feed on foliage, stems, fruit, and seeds using their piercing and sucking mouthparts. Feeding causes discoloration, scorched appearance, wilting, and in severe cases death of the plant. Biology: Eggs are laid in loose soil and hatch in 4-7 days. Nymphs have brownish gray bodies with orange or reddish markings. Developing wing pads are dark brown. The abdomen has a transverse white page in the middle and an alternating brown and grey pattern in the margins. Nymphs molt a few times and mature into adults in about three weeks. Adults are 3-5 mm long, grayish brown, with a slender body and silvery gray wings. Margins of the folded wings appear like an X. Note that true chinch bugs have a triangular black marking near the middle of the outer wing margin. Management: Mass migration of false chinch bugs lasts for a short period and many plants can with stand minor damage. Chinch bug infestations usually do not require any treatment, unless plants are at a vulnerable stage or there is a serious damage. Some of the common pesticides can be effective, but it is important to refer to the product label and pest management guidelines specific to the crop.